Thanks to the publishers, I have two copies of “Wayward Saints” by suzzy roche (No, my shift button did not quit working – this is how it is written on the book cover). To be entered to win, you must be following this blog, and leave a comment and your email address. Drawing will be Tuesday, January 17, 2012. Books will only be shipped to US addresses. “Mary Saint, the rule-breaking former lead singer of the almost-famous band Sliced Ham, has given up on music after the death of her band member and lover Gargagio seven years earlier. With the help of here best friend, Thaddeus, Mary is trying to make mochaccinos in San Francisco. Meanwhile, back in her home town of Swallow, New York, her mother, Jean Saint, struggles with her own ghosts. When Mary is invited to give a concert at her old high school, Jean is thrilled, though she’s worried about what Father Benedict and her neighbors will think of songs such as “Sewer Flower” and “You’re a Pig.” But she soon realizes there are going to be bigger problems when her arch-nemesis, Adele from the Silver Tray Bakery, gets involved. Wayward Saints is a touching, emotionally complex, and hilarious look at how the past always bumps up against the present. Punctuated by winks at the music business and loving flourishes about family, faith, and the unpredictability of talent, the novel touches on the very deep pain of loss, and the possibilities of the miraculous. I have always loved to read novels, but whatever drove me to sit down and write one is a mystery. Through the years I’ve had a tendency to create poems and stories but they remained, for the most part, private. 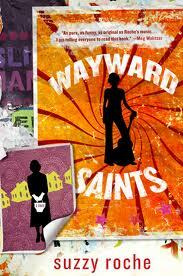 I like to think of Wayward Saints as a fable. I wanted to write about faith and art, and how it manifests differently in everyone. I also wanted to write about the absurdity and dangers of the music business, the consequences of violence, the power of forgiveness, and the possibility of the miraculous. I guess I know that my book is a little unconventional, but I hope it will find its place in the world, and be meaningful to someone out there. I’m grateful to other writers who encouraged me, especially Meg Wolitzer, who has been uncommonly generous with her time and also has shared her process with me. Also, I am incredibly lucky to have met my agent Gail Hochman and my editor at Hyperion, Elisabeth Dyssegaard. I can’t wait to read this new book!